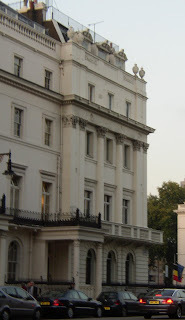 A few weeks ago I went down to London to see Susan Wilkinson, the author of MIMOSA, give a talk in Canning House, 2 Belgrave Square - a very salubrious address in London. 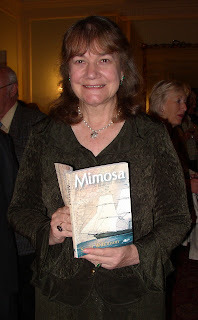 MIMOSA is the biography of a ship. It starts at the beginnings of shipbuilding and then goes on to consider the history of one tea clipper in particular. It is an unexpectedly good story with a little politics, a lot of globe-trotting adventure and a sad ending. Just like the people who sailed in her this ship seems to have a life: a birth of great optimism in Aberdeen in Scotland, a glorious maturity when it sailed the high seas and had some importance, and an old age when it was gradually dismantled and, as a hulk, served as anchored offices off the West African coast. Along the way she carried tea from China, and sugar and cotton from Brazil, but her most famous cargo was the human one she took from Liverpool to Patagonia in 1865. All aspects of these cargoes is thoroughly researched and investigated but, above all, very well written. It takes a great deal of skill to make a book about an inanimate object like a ship come alive but Susan Wilkinson succeeds wonderfully. Susan Wilkinson was born in India where her Irish father was a doctor and her grandfather an engineer with the Indian railways. (He was knighted by George VI for his work.) Her father's brother was also a doctor and was personal physician to Jinnah, founder and first Governor General of Pakistan. When she was a child Susan's family left India after Indian independence and went to Ireland where she attended school in Dublin (Alexandra College). It was a very classical education. She learned no science, botany or biology as they were not compulsory subjects, but received a thorough grounding in Latin, Irish and Literature and History as well as Greek myths. She says her teachers were wonderful women who inspired her to read, read, read! and she is still in touch with her English Literature teacher who is over 90 and still as sharp minded as she ever was. At 18 she left Ireland and trained as a nurse in England, travelled to Greece, Israel, New Zealand and South America and emigrated to Canada in 1972. In South America she worked at the British Consulate in Buenos Aires as a secretary which gave her a chance to meet her Argentine relatives whose ancestors had emigrated from Ireland in the 19th century. Argentina became an inspiration for her writing and still remains so. She is married with three children and one adorable grandson. SW: I do have an interesting connection with snails, an Irish snail! When I was a child in Dublin I have some horrible warts on my right hand and an old Irish woman told me that she could cure them. She took a dandelion stalk, smeared the "milk" on the warts and then looked for a snail in the garden. She put a horrible big snail on the warts and told me that when the snail died the warts would disappear. Well, about a month later I did not have a mark on my hand and the warts completely disappeared! SW: I think my proudest moment was when Sebastian's Pride was accepted for publication. SW: My life changing event was to emigrate to Canada as I left Ireland, began and new (often difficult) life in Canada, met my husband and had 3 children. I don't know what my life would have been like had I stayed in England or Ireland. CD: What is the saddest thing you’ve ever heard of or seen? SW: Poverty in India, especially among children who were sometimes sold by their parents to be servants when they were just 5 or 6. CD: If there was one thing you’d change about yourself what would it be? SW: A certain impulsiveness and not thinking things through! SW: I suppose happiness is a state of contentment, opposite to unhappiness. CD: What is the first thing you do when you get up? SW: Have a cup of coffee and read the morning paper. Questions about the writing of the Mimosa. CD: When did you first hear about the MIMOSA? SW: I can't remember when I first heard about Mimosa. CD: How long did it take you to research and write the book? SW: The book was written over at least 10 years or more, just getting information from various sources, visiting libraries and maritime archives in the UK, visiting Wales and Patagonia to meet and talk to people whose ancestors had sailed to Patagonia. It took a long time to discover all the details of Mimosa's life and times, and I did not hurry. CD: What was the most difficult part to research? SW: The Patagonian part as it was the most important part. There is so much myth and fiction now attached to the voyage and landing and I decided to only include what could be substantiated by fact. CD: One of your ancestors Thomas Green was doctor on board ship - did you find out anything useful for the book purely from relatives? SW: I discovered that he had kept a journal of the voyage and his experiences in Patagonia which was lost on his subsequent travels in South America. I also discovered a copy of his contract with Michael D. Jones and a couple of receipts he had been given by the colony in payment for flour he had had to buy in the first months. I discovered that his oldest brother, also a doctor, was in Liverpool at the departure on May 28 and saw him off. CD: What was the most moving discovery you made during your research? SW: The most moving discovery was the lives of the Welsh passengers and how many young infants and children were on board and how many died. CD: And the discovery that surprised you the most? SW: The discovery that surprised me the most was that a painting exists of the ship. The painting was sold when the man who held it on the Isle of Wight died (probably around the 1980's) and no one seems to know how presently owns it. CD: You have also written fiction (SEBASTIAN'S PRIDE - excerpt here) as well as non-fiction - which do you prefer writing and why? SW: Non-fiction was a departure for me. 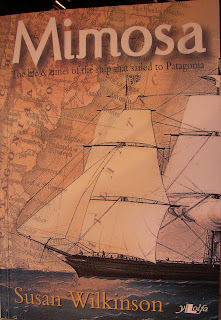 I was not sure that I could do it, but I found it fascinating to research and write this book on the Mimosa. I think my skills as a fiction writer were helpful as I could try to imagine the lives of the various people who built, owned or sailed on her. I think perhaps a non fiction writer is taken more seriously as a writer than a fiction writer. I prefer fiction, but I would like to write something else in non fiction sometime in the future. Great to catch up. Interesting interview - thanks! How can I write or contact Susan Wilkinson? my name is Susana Biset and I am a writer from Argentina. I am writting about the incoming of celtic people to our patagonia and would like to know about the mimosa. If you are interested in Argentine history and an exceptional love/life story, I highly recommend Sebastian's Pride, her story of one of our "gauchos".